This long anticipated day is finally here! 😀 But for many, this special day still hasn’t come yet — a big spoiler warning to everyone who does not have New Leaf! It’s not anything extraordinary, but I’m happy with it! I was looking for triangle grass, apples, a river that isn’t too long and winding (but not too short and simple either), and a waterfall that meets the ocean at the bottom of town. I also had pretty strict requirements for building placements because I want one side of the river to have a city atmosphere (with the train station, town hall, and Re-Tail shop), and the other side of the river to have more of an earthy garden atmosphere (with the town tree plaza). I was sooo nervous about picking my house location! >_< I'm pretty sure the mayor's house is permanent, so choose carefully! I ended up placing it in a nook formed by the river. How sweet and supportive (and trusting of a complete newcomer to run the town 😛 ) they all are! It was also great meeting all the various workers and shop-owners, old and new: Pete and Pelly, Reese and Cyrus, Timmy and Tommy, the Ables, etc. Then I went around shaking trees and selling shells until I had enough money to buy a shovel and fishing rod, which of course opened up new ways of making money — and donating to Blathers! I can’t believe how quickly I was able to catch these. 😮 I caught the hammerhead, walked just a few steps up the beach, saw another finned fish, and it was the shark! I keep hearing how it’s easier to make money in New Leaf, and it does seem to be true in my experience so far. The down payment for my house wasn’t bad at all, only 10,000 bells! I was expecting at least double that. I love all the details on Main Street: the dirt path, stepping stones, bushes, and cute little flowerboxes. Donating to Blathers is so quick and easy now that you can give him multiple items! 😀 I might miss his long-winded responses a bit, though. Maybe he’ll still do that if you only give him one thing to identify/donate? Found a delicious apple! I shook it down, but figured that I should probably wait until I get an axe to plant it, so that I can cut down a tree and bury the apple where the tree used to be — ensuring its growth. In the evening I worked on finding homes for three more residents of Citàlune: Lyra, Violet, and Fern. It probably isn’t necessary to have them right now, but later on I bet I’ll need more pattern/storage space, and I think it’s best to go ahead and pick their house locations now, before more neighbors move in. I didn’t feel as nervous about picking their house locations because I think you can demolish non-mayor houses any time, though it will also remove the resident from town, I believe. I carefully chose all the house locations, so I might not ever have to do that, but I’m glad the option’s there. We can pretend that Lyra moved out of the abandoned Seahaven and into Citàlune. And Fern’s is on a cliff overlooking the sea. I wish I could have paid off all their down payments, but Nook’s Homes closes at 8 PM, that’s really early! >_< Oh well, guess I’ll have three tents around tomorrow. 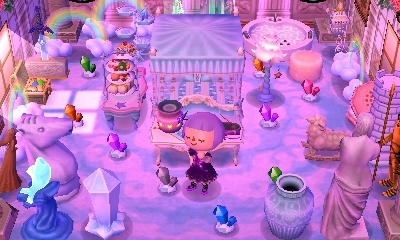 Part of the reason why I decided to name my town Citàlune and its mayor Estel is because both names allude to the night sky (lune—moon, stel—star), and I think nighttime is incredibly beautiful in New Leaf. 🙂 Can’t wait to see things like meteor showers and the aurora borealis in my town! Posted on June 10, 2013 by Amy •	This entry was posted in AC:NL, Citalune and tagged Animal Crossing. Bookmark the permalink. Good luck with the new town and all! Congratulations!!! Citàlune looks awesome! And ahhh you got the blue station+town hall by accident x3 That was a lot of conditions your town met, though! For the apples and grass I guess you have to actually set foot in the town first, before you can decide on it (did you have to do that a lot?). It feels like a well-balanced map and I like how unique each of your characters’ house positions are! Whoa nice catch, getting two sharks so quickly! 😯 We got the game in a good season xD Did you sell them or donate them? 😛 And the rock you broke is the only non-permanent rock in your town (it’s like a “fake” rock xP). All your other rocks are permanent and the extra gem rock will pop up in a random spot each day. Thanks Teru! 😀 At first I was picking the best map that Rover showed me and going into town every time, but eventually I started only going into town if I really liked one of the maps and it fit all my requirements. (I figured that even if a map that didn’t meet my requirements had triangle grass and apples, I still wouldn’t really want to settle on it.) Sometimes you can see if a town has a certain grass shape or town fruit before exiting the train because it shows a view of the train driving across the tracks and into the train station. I was starting to get discouraged while resetting, wondering if I’d set too many conditions and if I’d better settle with something less (so that I wouldn’t be resetting for ages D:). And then wondering what would be the minimum requirements I would settle for… So I was very glad that this town turned up that has all my requirements, plus the blue train station and town hall! ^_^ It might not be 100% flawless, but I’m sure I’ll love it even more once I get to customizing it for my tastes and plans! I love the way you got the blue train station and town hall! And you didn’t even get them on purpose, LOL. They’re the ones that I want, but I’m thinking what if I look at a town with all my ideal requirements, but the train station is green and the town hall yellow or something. But you can update them in time, at least. 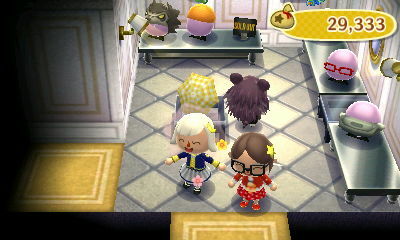 Your villagers are pretty cool, as I said, but kinda random – a pink bear. Named Vladimir. But, yeah, good luck getting your dream neighbours! That should be a great house location! I would've put a house near the other waterfall, too, but my town tree is very close to that waterfall, so I can't do that… but on the other hand, I do like that my town tree is near the waterfall, it kind of enhances that special area. 🙂 Also, just a quick tip about how the house selection process works: It seems to be based on the "square" you're standing on as you talk to Nook. So if he says something's in the way (like a rock or cliff), you could just move one square away and see if it works. For Violet's house location, I got the house as close to the cliff/waterfall as I could without him saying anything was in the way. I picked what are often called the 'anime' eyes because of how they look sparkly, it's like they're starry eyes for Estel, whose name means star. 🙂 And that was my thinking as well about the town hall and train station colorings; if I'd found a town layout I liked with triangle grass and apples, but with not with my favorite train station and town hall designs, I would've picked the town anyway. Yeah, I’m not crazy about the grasswear either, though I’ve heard that the rate of deterioration is not as fast as it was in City Folk, and that it grows back faster. So far I’ve been playing in my town as if there wasn’t any grasswear, pretty much walking all over town looking for fossils, weeds, new flowers, etc. It might come back to bite me later! 😐 But I hope I can figure out some good pathways for my town soon, I haven’t done that yet. I usually plan paths by using a gridded map, which I should probably make for my New Leaf town soon. I’ve heard that too! Hehe, and I was planning on giving Fern green eyes. 🙂 Can’t wait to customize my characters’ appearances more! Reading this post makes me want to go buy New Leaf! I wasn’t going to, but now I mightt…it’s just all so expensive and I know they’ll just come out with a newer version of the DS! Aah, I’d been waiting for your to start on your New Leaf town! I’m from Europe, so I’m not getting the game until tomorrow or even the day after, but I’m already planning the kind of town I want as well. Citàlune looks absolutely gorgeous though, and I just adore the moon&stars-theme you’ve taken with it. Did you also make Citàlune a ‘late-night town’? I agree about the nightime too, it’s so much darker in New Leaf and the moonlight highlights the tip of their heads. I’m really enjoying the realism in the games graphics, even the grass looks detailed and light shines off it from a distance too! I’m still to make second characters but I’m pretty sure I’m settled on the path design I showed you a few weeks ago. Oh, I don’t have Jay, I have a snooty named Robin. 😛 But I like Jay, too, he’s been around in various towns of mine (AC:GC and various AC:WW ones) lots of times! Yeah, I did take a lot more pictures than I included here. Since it’s so easy now, I go a bit overboard with taking pictures sometimes, and it would be way too long of a post to include them all. xD Ahh, I’ll go read your post, can’t wait to see what your town’s like! Ah, I don’t know what made me think he was Jay. Well, they’re both birds so I guess I’m partly right… kinda… not at all. I filled my SD card with hundreds of pictures so I’m really using my blog as a way to unload them and remove them from my card. I agree, the ease of taking them really does make you want to save more of your memories. I love the water effects too, in fact I mentioned that in my post too! Especially in rivers, the waves are so detailed. 🙂 Hm, I may think about doing a comparison post between their graphics, it might be fun! I’m still in the habit of keeping closed too, City Folk was very much the same in terms of inactivity. I’ll look forward to visiting! Did you have to reset a lot to get the town you wanted? I been resetting so much, but I feel like my standards are too high. 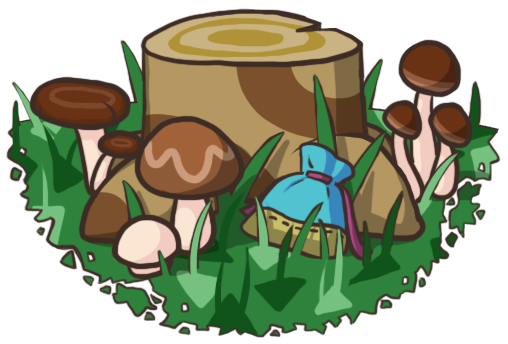 I want circle grass, cherries/apples/peaches, blue train station and blue town hall, south facing waterfall, and a town tree that is not next to Re-Tail. I am getting discouraged but I don’t want to “settle” because then I’ll end up resetting anyway. It’s frustrating but I have to keep trying! Your standards don’t sound too high to hope for! Some people out there even reset for specific maps, and it sounds like you aren’t that picky. Your requirements seem pretty understandable and reasonable to me! I know the feeling, it’s really discouraging to wonder if the right town will ever pop up… but it will eventually, so don’t give up 🙂 Good luck! Sorry if I am spamming but this blog actually inspired my Animal Crossing blog. If you went on my blog and gave me some feedback I’d be very appreciative.